Scandinavian airline SAS will launch flights from Copenhagen to Newquay in Cornwall next summer. Flight will operate twice a week from June 28 on a 90-seat CRJ 900 aircraft. SAS said the flights would not only provide the first direct link between Cornwall and Denmark, but they will also allow passengers to connect to a network of more than 70 onwards destinations in Europe, Asia and North America. 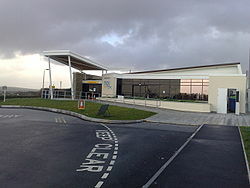 Al Titterington, Cornwall Airport Newquay MD, said: “This is brilliant news not just for the airport, but the local region of Cornwall and beyond. Adding to our confirmed direct European services to Alicante, Cork, Dublin, Dusseldorf, Faro and Stuttgart next summer, we’re sure that Copenhagen will prove just as popular. SAS will be the sixth airline to offer flights from Newquay, joining Aer Lingus, Eurowings, Flybe, Isle of Scilly Skybus and Ryanair.